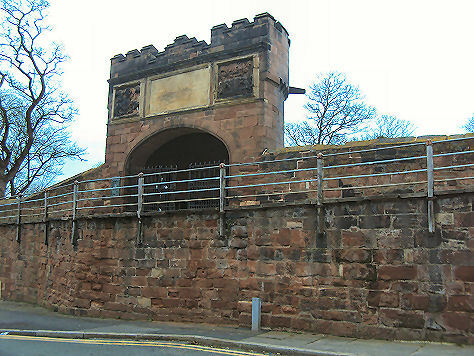 Pemberton's Parlour, otherwise known as the Goblin Tower or Dille's Tower, stands on the northern section of the Chester's city walls. 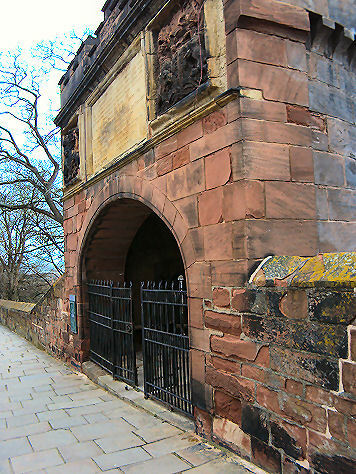 The red sandstone crenellated tower has an arch leading to a semicircular chamber with seating which faces the walkway of the walls. Above this are three panels, the lateral ones containing the royal arms, and the arms of Chester in relief. Originally a circular tower straddling the city walls, which was far higher than the present one, it was rebuilt as a semicircular tower during the reign of the last Stuart monarch, Queen Anne. It was again rebuilt in late Victorian times (1894) due to the constant vibration of nearby trains. The original plaques from the old tower were placed over the entrance to the new, although now very weathered, they are just about legible. The tower is said to derive its name from John Pemburton, a former mayor of Chester, who stood on it to supervise the work taking place on his nearby ropewalk.